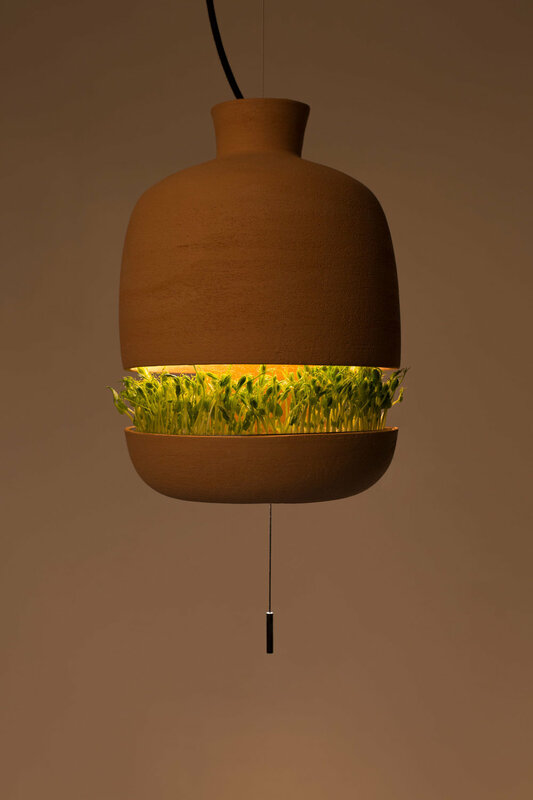 The Brot is a lamp and a germinator designed by Caterina Vianna and Ferran Gesa. They launched a studio specialized on furniture for food, Benditas. Brot has a double function, it is a lamp, which creates a warm and cosy environment, and a way to grow your own food in a different way. Acting also as a germinator it is a perfect device for growing sprouts. Brot is an innovative way to combine food and furniture. Brot is formed by two elements made from terracota: the vessel, which holds the stainless steel tray with seeds, and the screen, to redirect light to the sprout and the room. The center of the vessel also has a circular opening, which allows the light pass through and creates a defined light spot bellow it. The light, reflecting off the terracotta ceramic surface, creates a warm atmosphere and helps the sprouts to grow more colorful. This combination of elements creates a dialog between food and furniture. The design also responds to society ́s growing concern in following a healthier diet, making it fast and easy to germinate seeds.